I’ve been casually tracking the daily active user numbers for the top 40 Facebook game developers for the past six weeks. Why the top 40? Because that’s the quantity displayed by Appdata.com on the first of 200 pages. Why daily active users? Because monthly active user numbers are widely considered to be an unreliable statistic for Facebook games, whereas DAU is, if not perfect, at least more directionally accurate. I was mostly curious to learn how “hit makers” are faring on Facebook. (The 40th developer on the list has just 200k daily active users, so it’s safe to assume that all the heavy hitters are represented in the top 40 list.) Facebook’s total population has supposedly been growing by leaps and bounds over the past several months — it jumped from 350m “active” to 400m in the three months leading up to February 2010) so theoretically daily active users for the top 40 game developers should be growing as well, if for no other reason than there are more potential customers on the platform. However, it turns out the DAU count is down slightly since March. For a couple weeks now, I’ve been getting calls from friends in the industry bemoaning their lack of inclusion in the upcoming Summer of Arcade promotion on XBLA. The tone of the calls has varied, but they’ve all shared one thing in common — frustration with Microsoft. As I’ve thought about it, I’ve come to the following conclusion: Summer of Arcade will have to change or, at very least, cease to be Microsoft’s ultimate promotion for the XBLA service. First, a bit of history. Summer of Arcade was the brilliant brainchild of my good friend, Jeremy Wacksman. It was born of the realization that Microsoft desperately needed something that would draw positive attention to XBLA and make consumers, developers and the press take it seriously (bear in mind, this was during XBLA’s “inevitable misery” phase, when no one had anything good to say about the platform.) SoA served that purpose beautifully; it kicked off XBLA’s “triumphant return” and changed the tone of public conversation from “XBLA is full of crap” to “XBLA is the only place you can find games like Castle Crashers and Braid.” It also established the $15 price point on XBLA — an important and under-appreciated feat. Summer of Arcade still gives consumers and the press something positive to focus on. Unfortunately, SoA seems to be turning into a net negative for the developer/publisher community. Today, many companies will target a summer release in hopes of making it into SoA and may even choose to hold a finished game in their pockets for several months for that purpose. A couple months before SoA is scheduled to begin, ~five lucky development teams find out their games have been blessed; significantly more discover that they’ve been rejected. When I look at Facebook, I see a games platform that has been thoroughly enjoying the “early glory” phase of maturity. Not too long ago, there was guarded optimism about the potential of Facebook to host profitable games, but few good examples of such games. Less than a blink of an eye later, Facebook has become the apple of our industry’s eye. While most publishers are laying employees off by the hundreds, Facebook-centric publishers are hiring like mad. Savvy conference organizers are rushing to capitalize on audience demand for business venues to discuss social gaming. The inevitable stories of unbelievable growth have, quite predictably, become common-place. Facebook’s platform managers have finally started embracing our industry and contributing to the hype around their platform. And finally, a remarkable number of developers (and even large publishers) have begun to re-orient themselves towards the development of social games. This article was originally published by Gamasutra on 12/22/09, and later on GameSetWatch. 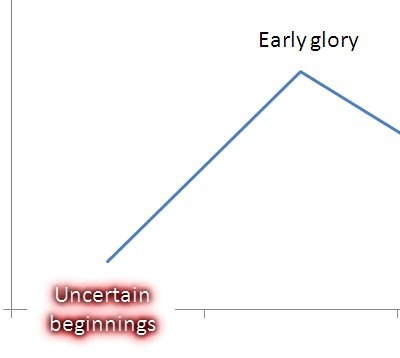 In my experience, one of the problems that most seems to bedevil game developers is the problem of timing; specifically, understanding when is the “right time” to begin developing for a specific platform. To understand why this is such a challenge for developers, you need to understand how a games platform tends to evolve. Here’s the typical scenario: A platform — for example, XBLA, or the iPhone app store, or Facebook — comes into existence. Most people regard the platform suspiciously, for a variety of reasons. It’s an unproven market, for starters. The platform owner’s commitment to growing the platform may be unclear. The pros and cons of working with the platform owner in this context are unknown. There are lots of other platforms to choose from. Etc. Most developers take all this into account and decide to pass on the platform for the time being. I wrote the following brief news analysis for a multi-industry expert network that I joined earlier this year. It’s high-level and not as detailed as I’d like, but I figured some of you might appreciate it. EA has just acquired social-network games maker Playfish for $275 million, plus an additional $25 million in equity retention arrangements and up to $100 million in additional cash contingent upon future performance. Playfish is one of the top three game developers in this space, the others being Zynga and Playdom (both privately held.) Zynga is widely rumored to be targeting an IPO within a year, leaving only Playdom as a wild card. The answer is complicated. On one hand, big video game publishers have a history of overpaying for top development studios. But on the other hand, while social-network games may seem like simple things, they are in fact dramatically different from the video games that publishers like EA have built their businesses around. EA is, in part, acquiring expertise. The traditional big video game publishers rose to prominence in part because they were capable of funding the development of robust, complex, multi-million dollar video games and in part because of their retail marketing and distribution prowess. In short: they are very good at getting people below the age of 35 to pay $30 to $60 for a boxed game that can be enjoyed alone on the couch or at the desk or with friends online. But social-networking games, by contrast, require a completely different product development and product marketing skill set. These games are free to play and generate revenue via optional microtransactions — they must be designed explicitly for the purpose of driving such transactions, as opposed to traditional games which can simply “be fun to play.” Furthermore, the core gameplay mechanic of any good social-network game must encourage players to invite their friends into the game — again, it cannot simply be “fun.” And of course, there’s no retail shelf to position a social-network game on; instead, developers must rely on non-traditional advertising, on the viral mechanics of their games, and on cross-promotion between online games to drive traffic. This latter point is critical. The top social-network game developers have become very effective at driving players from their existing games to their new games. This means that they are essentially capable of helping any new title reach a critical mass of players almost immediately, and for “free.” From that point forward, if the game is designed well enough (i.e. if it is highly viral and good at engaging and retaining players), it will succeed. So why did EA purchase Playfish? Because EA’s game designers are not accustomed to building games that focus mainly on viral design or on monetization via microtransactions. Because EA’s marketing people are not intimately familiar with the techniques necessary to market these non-traditional games to these non-traditional audiences. And because Playfish offers an established network of players that future games can be cross-promoted to. Of course, it certainly doesn’t hurt that Playfish is rumored to already be generating $50 million a year in revenue. Lastly, Playfish was likely the “cheapest” of the three established game developers in this space. One could certainly argue that it would have been cheaper for EA to spin up one, two, or even three independent studios and charter them with experimenting in the social-network game space (especially if they’d had the foresight to do so two years ago.) Eventually, one studio would have hit on a successful formula, just as Playfish did. And perhaps other major publishers, such as Activision, should be considering such a strategy. But EA’s acquisition of Playfish certainly makes sense… it simply remains to be seen whether they overpaid or not. The Death of Lead Gen? It’s been a while since any given news story caused five different people to spontaneously email me. The latest story to do so is the Techcrunch exposé of scam artists who are working through the popular lead generation services (such as Offerpal) that are used by most major social gaming companies. The story has already inspired quite a few responses, such as these thoughtful articles by Andrew Chen and Justin Smith, and this entirely predictable response by Mark Pincus, the CEO of Zynga. My quick two cents: have the lead generation services (and therefore the social gaming companies, and therefore Facebook itself) benefited from the behavior of scam artists? Yes, absolutely. Should the lead generation services immediately do something to address the problem (and if not them, then the social gaming companies or Facebook itself?) Yes, absolutely. Does Facebook “deserve to be sued”, as one of my good friends suggested to me? No, it does not. Does this whole thing prove that social games are a house of cards? I highly doubt it. Facebook is a popular open ecosystem, and like any other popular open ecosystem, it will be exploited from time to time by unethical people. There is always the argument that Facebook “could be doing more” to police the ecosystem (and in fact, it had already announced a plan to do precisely that as part of larger changes to the platform) but at the end of the day you simply cannot compare Facebook to the Playstation, to Wal-mart, or to any other closed ecosystem. Facebook has an essentially unlimited number of “content partners,” and while it should keep a close eye on the biggest of those partners, it is inevitable that some shadiness will eventually slip past the Facebook Police. Sony and Wal-mart, on the other hand, have the advantage (and the great burden!) of controlling everything that enters their virtual and/or physical shelves… and they have much smaller shelves. So while I hope that Facebook will indeed do a better job of catching scams in the future, I don’t blame it, and in fact I hope it chooses to emphasize crowdsourcing techniques (i.e. better enabling users to flag and stifle abusive 3rd parties) as much as expanded police squads. The social gaming companies turned a blind eye to their part in this problem, and now they are catching flack as they deserve. But this will blow over, and lead generation will likely continue to represent a significant percentage of their ongoing revenue. Why? Because at the end of the day, there are legitimate advertisers, content providers, and 3rd party networks with a vested interest in the success of this model. These aren’t all late-night, 1-800-type con-men; these are advertisers like Netflix, FTD, and GAP and product/service providers like Apple, The Wall Street Journal, and The New York Times. The only “house of cards” here is the house that Tattoo Media built.